March 10, 2005. With the words “Hello from Sydney,” Superman Returns director Bryan Singer opened the doors of the production to the hungry masses online. In preperation for weeks, the premiere of the first of Bryan Singer’s video blogs was dropped on the fan community completely by surprise. In this first video, Bryan announced that he and his team would be creating regular video blogs from the set of the film, and releasing them on BlueTights.net for the duration of the shoot. This, of course, meant a slight redesign of the site. It wasn’t a massive departure, but we made room on the front page for the video journals, and setup a “Latest Headline” and a series of recent news below it. It wasn’t a perfect UI setup, to be honest, but it became a staple of the site. We kept the layout pretty much the same, but integrated the forum login into the main site, and started a devoted space for editorial features. The usual stuff on the front page, but the community itself was quickly becoming the focus of the site. And it was by the request of this community that we finally started a podcast, called SuperTalk Concern. I don’t have the episodes online anywhere any more, but I’ll look into getting them back up if you’re interested in having a listen. Iwas quite fond of them, personally. The podcast saw BT all the way through the launch of the film. June 20, 2006. Dozens of BlueTights.net members lined up in Los Angeles at the Grauman’s Chinese Theater to be some of the first to see Superman Returns. We huddled together to keep warm, playing card games, reading comics, and generally getting far too excited about the event we’d all been waiting years for – the return of Superman to the big screen. We all got comfy for the night on the famed Hollywood walk of fame. By pure chance, I slept on the star of Glen Ford, the actor who played Pa Kent in Superman: The Movie. The next morning, we had our coffee, greeted passers-by, and spent the entire day in a frenzy that I haven’t felt since Batmania in 1989. It was glorious. Actor Stephan Bender (young Clark Kent) and Superman Returns co-writer Michael Dougherty came by to see the lines, entertaining guests and answering questions until finally, the time had arrived. We were treated to an amazing viewing of Superman Returns, with Bryan Singer and much of the production crew sitting near the back of the theater. For our community members, it was quite a surprise to see a few little in-jokes dropped into the film. The mention of burritos was there, plus an amazing shot of Superman recharging his powers that was inspired directly from a fan poster created by Dan-El. It’s the one to the left. Anyway, the film was finally out, the reviews were written, and the community… was pretty split down the middle. It almost seems inevitable in hindsight, but there were just as many people who didn’t like the film as did. I personally loved it, but that’s because it tapped into all the father/son/legacy things that I most love about the DC Universe. But alas, there was much discussion in the ensuing months about what direction the sequel should go in. By this time, I’d begun to step out of the community. The volunteer staff from The Planet was taking over the forums and the main site, as discussion of a sequel began to dwindle. Years later, we’re on the verge of a Superman reboot under the mentorship of the exceptionally competent Christopher Nolan. I’ve stepped out of the community entirely. With my family growing and a career building online communities, BlueTights.net has, unfortunately, become a low priority for me. I’d always said that I’d run the site as long as I loved it, and, well… the end has fianlly come. 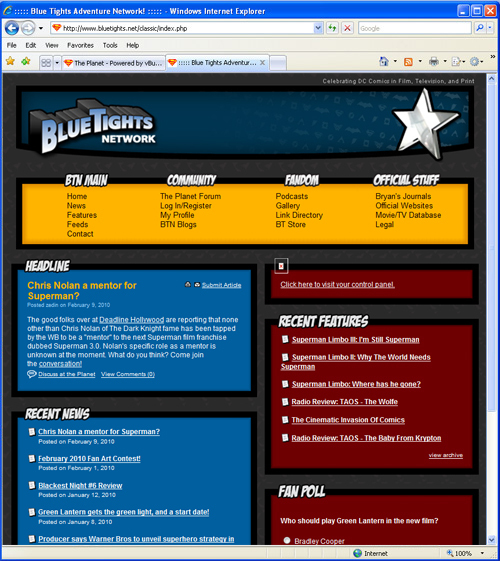 April 30, 2010 is BlueTights.net’s last day as a stand-alone site. Over the course of 6 years, BlueTights.net has had a great run, and I couldn’t be happier with the life of this vibrant and creative community. But all good things must come to an end some time. Thanks to the BT Community for years of amazing support and passion. That was a fun read. I enjoyed it. As someone who has been building his own site for half a year, it was interesting to watch how your site evolved. It takes a lot of hard work and at least a bit of luck. i superman live in bpt ct only is alive and well iam the real superman for usa only for thrust justice and american way still today and forever and ever! Hope you’re well and hope you remember me…! I found your blog when I was scouring the internets for any remnants of the BTN – SuperTalk Concern podcast! 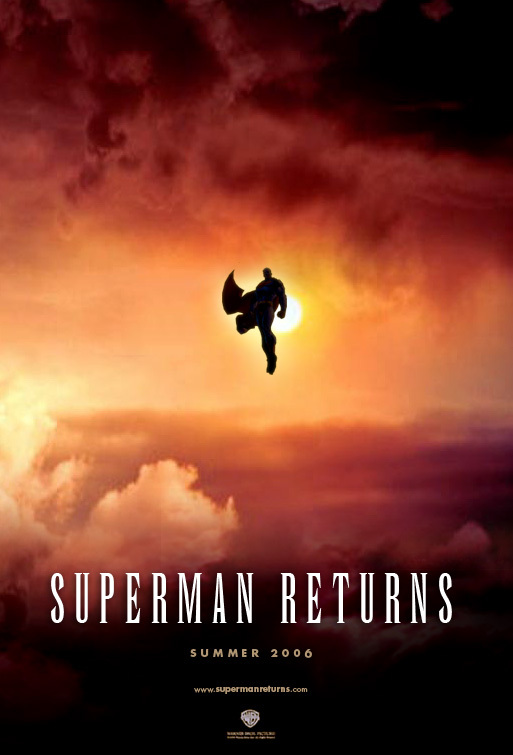 After catching up on Smallville and revisiting some old comics and movies, my mind was cast back to 2006 and the build up to Superman Returns! Anyway, keep on blogging, stay in touch! Would be great to connect again.